I’ve been getting much more interested in vegan beauty products as of late. I used to wear eye makeup, mostly fun colored eyeliners, in high school and until my 20s loved painting my nails (I only stopped because I started working in restaurant kitchens where polish is a no-no), but other than that I’ve always been extremely low maintenance when it comes to beauty routines; a splash of water on my face and I was ready to go. As for what sparked my current interest in beauty products, who can say? It’s probably a mixture of being excited about the possibilities for artistic expression and having a desire to nourish my skin from the outside as I do from within. The latter is somewhat backwards from what most people do, I think, but I’ve always done things in my own order. So surprise, surprise! I wish I had the funds to delve into the vast array of vegan beauty products, but alas, I’m not in that position. That’s why beauty boxes are so awesome. For only $15-20/month (depending on which beauty box you subscribe to), you can get a taste of what kinds of products are available to you. 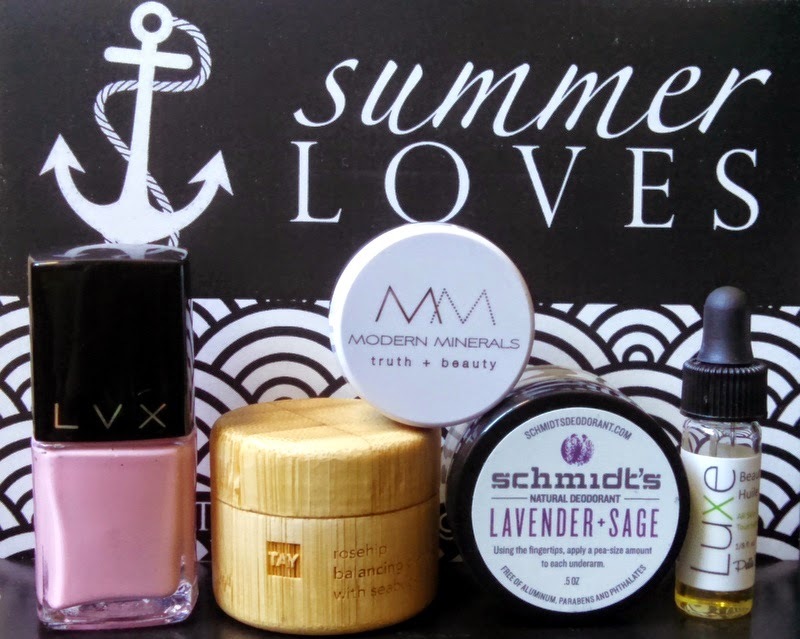 I had a lot of fun trying out the Vegan Cuts beauty box this past spring, and I was eager to continue on with my vegan beauty education. Around the time I reviewed that box, I started to hear a lot about the Petit Vour box. I checked out the website, and I was tres impressed. I loved the attention brought to featuring not only the highest quality vegan brands, but ones with clean, non-toxic ingredients to boot. That is a huge bonus for me because I not only have to make sure my beauty products are vegan and cruelty-free, but for the sake of continuing on my healing path, I am very, very picky about what I put on my body. I looked into which products had been included in the past, then I did a little bit of research about each product’s ingredients just to make sure they’d be up to my health standards. Again, tres impressive! That put my only reservation about subscribing to this beauty box at ease; I was only worried that I’d spend $15 a month and not be able to use 1/2 of the products because they contained ingredients I won’t use. Since that was a nonissue with Petit Vour, I went ahead and got a subscription to their beauty box with my birthday money. Woohoo! What I really love, in addition to the clean ingredient lists, is that I get so much value in each box. I’m paying $15 for a box that includes several full-sized products in addition to generous sample-sized products and that would retail for well over $30. I always feel like I get more than my money’s worth. What I also love about the Petit Vour boxes is that they make an effort to include products that will look good on various skin colors. In the past, it seemed like some companies and boxes favored cooler colors that just wouldn’t look great on me. I appreciate that when I get a box from Petit Vour, I’m not worried about getting products in colors that will wash me out. The July box, co-curated by Tashina of Logical Harmony, was my first box, and I basically died and went to heaven when I opened it. Because of my aforementioned high standards, I’m so used to being like, “Wow, this is really great, but…”. Not with Petit Vour! I felt like the box was specially put together for me. I loved every ounce of it. It couldn’t hurt that LVX‘s Lolli was included in the box. 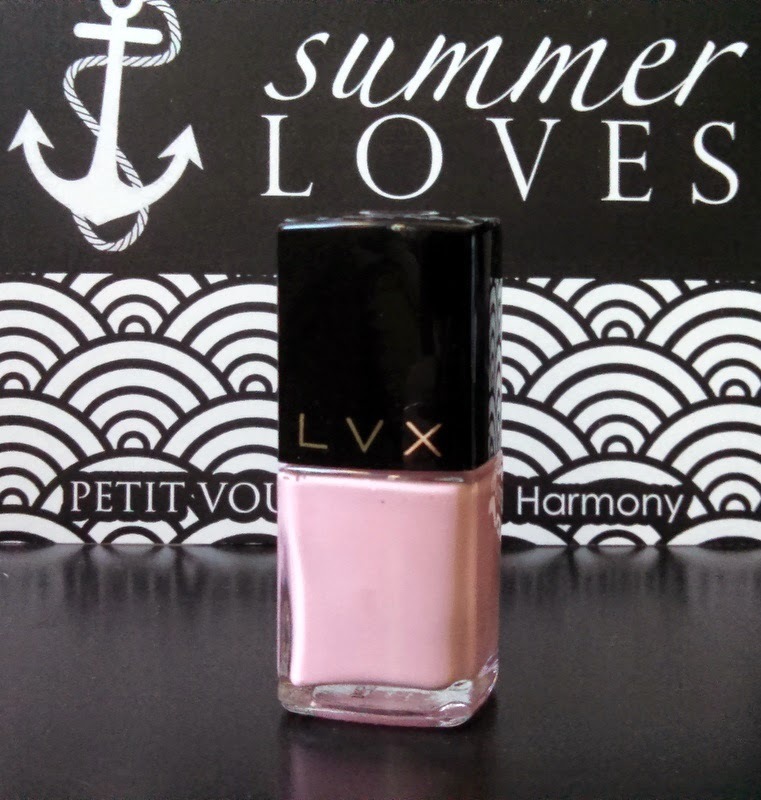 I’d been lusting over that color since they debuted it in their summer collection. 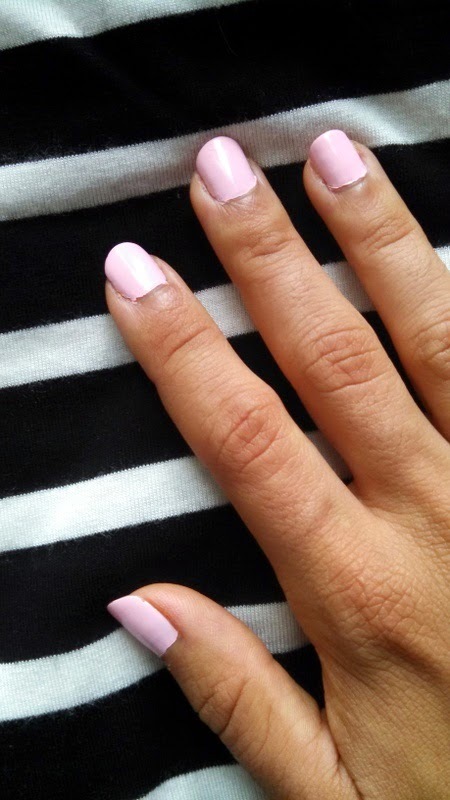 It’s the most perfect pastel bubblegum pink that is playful and elegant at the same time. I’ve yet to see anyone look less than stunning with it on. I am obsessed with this color. Pelle Beauty is a completely new company to me, and I am so thrilled to be introduced to them. 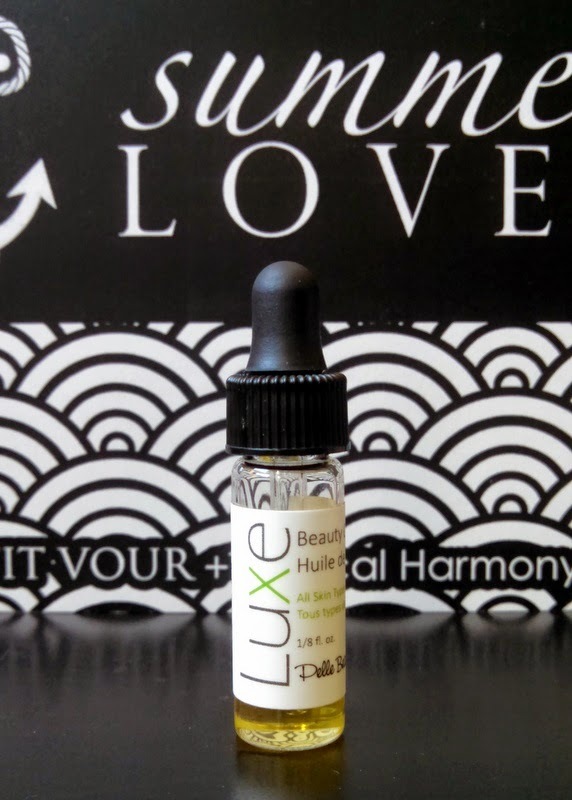 I received the Luxe beauty oil in my box, and have been using it religiously. The full-bodied scent (a blend of jasmine, cucumber, neroli, ylang ylang, meadowfoam and more) is an amazing aroma and makes for terrific aromatherapy. I just love falling back onto my pillow at night and having every breath heavy with this soothing, deep scent. They have several other face oils, too. You can check them out as well as their other skincare products here. I’m totally smitten with Pelle Beauty. The Modern Minerals eyeshadow in Vixen was a cool find in the box since I mentioned how I love jazzing up my eyes. Described as “soft brown with gold highlights”, this shade is nothing short of glamorous. 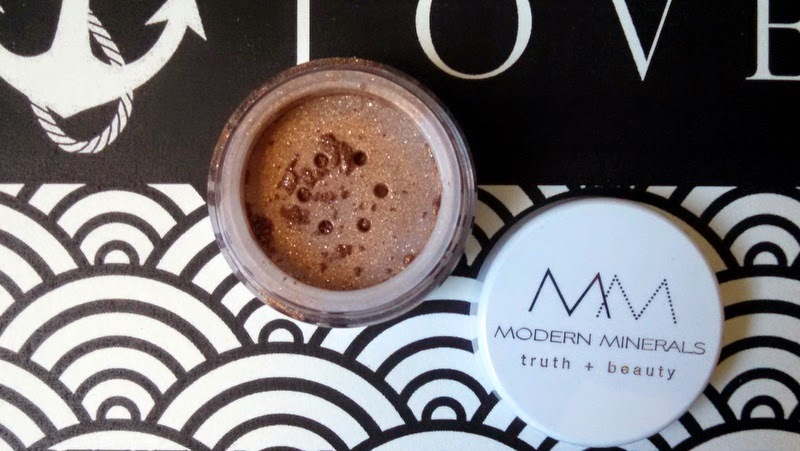 Loose mineral powders are new to me, so it’s fun to learn how to use them. My favorite way to use this one is to line my outer eyelids with a dark eyeliner and then use a small brush to line my inner eye with Vixen. It makes my eyes glisten, but it’s also toned down enough for everyday wear. Schmidt’s deodorant has been on my radar for some time, and I’m so happy that I finally got to try it. I got the Lavender Sage scent, which I admit was a bit too heady for me, but if you like to have a stronger smelling deodorant with a scent that lasts, this one’s for you. They have several other scents and an unscented one, too. I’d love to smell the ylang-ylang calendula one. That’s more my style! It worked marvelously, keeping me dry and smelling of flowers even through hot, humid summer days. I’d say it even worked a little too well because my underarms were so dry that I started getting some irritation. 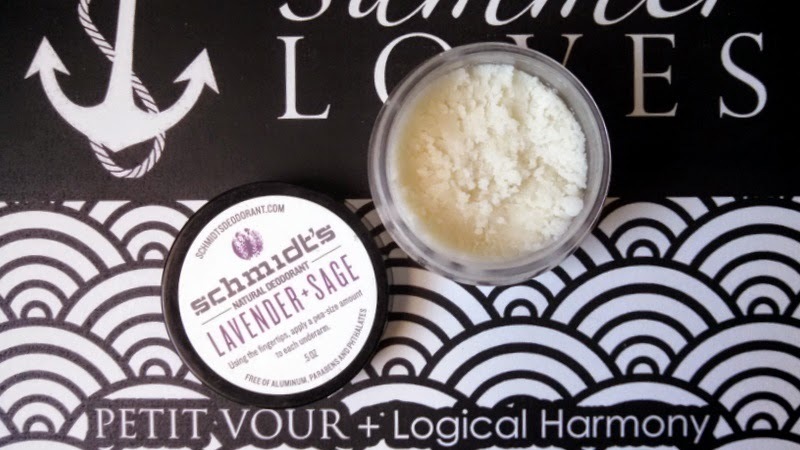 Schmidt’s deodorant comes in glass jars instead of tubes which is great for reuse. You have to apply with your finger, warming it up between your fingers then spreading it on your underarm. They also have an applicator inside to help scoop it out. For some people this application process is a turn-off. Maybe it’s because I’m hyped on the eco aspect of the product, but I didn’t find it bothersome, especially because once you put it on there’s no need to reapply for the rest of the day. Even though this wasn’t exactly the best deodorant for me, I still think it’s one of the best out there. It works much better than most other natural deodorants. So, I’d say it’s worth trying out. The Tay cleanser was a bonus sample because it was my first box. 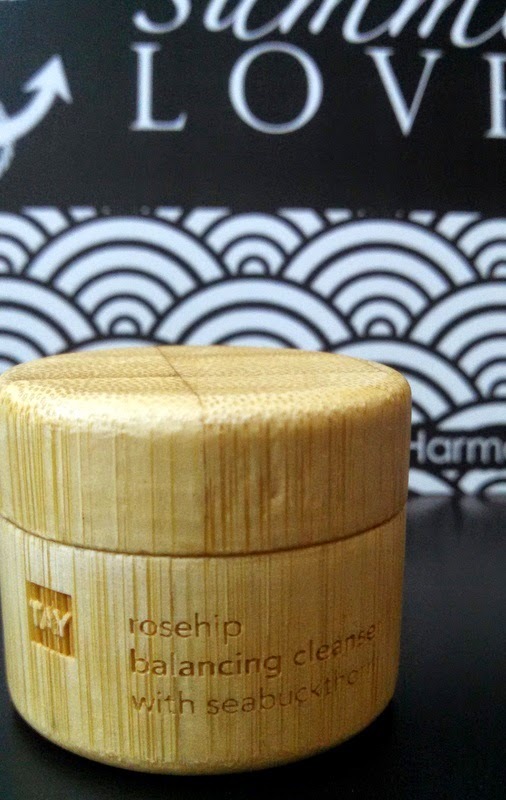 The rosehip balancing cleanser with sea buckthorn is pretty great. I haven’t used any other cleansers of this caliber, but at the very least it’s inspired me to spend a little bit more money for a quality cleanser. I started to use this sample in combination with the Pelle Beauty Luxe oil at night, and oh my goodness, my face was so pillowy soft and silky in the morning. I’ve always relied on reducing stress and eating healthily for great skin, but I now see that using a few stellar products on my face can really make a difference, too. So, that was July’s box. I can say I’m officially hooked on the Petit Vour beauty box!